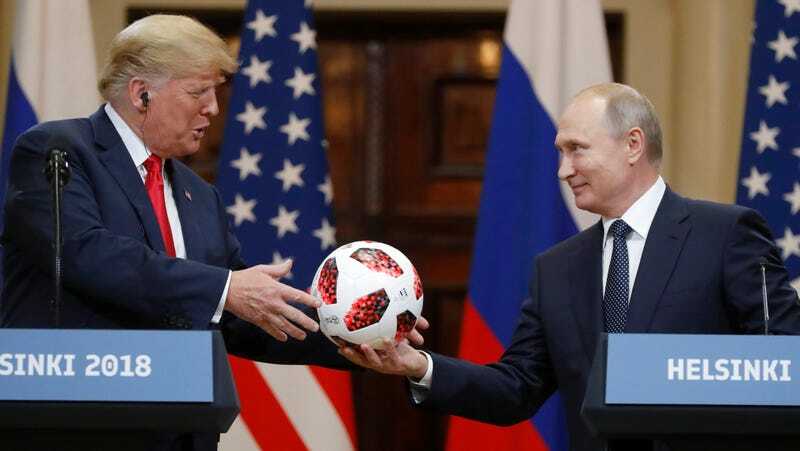 Putin gives Trump a soccer ball at a conference in Helsinki, Finland this week. While at a conference alongside Russian President Vladimir Putin at a high-profile conference in Helsinki this month, Donald Trump took some time out of relentlessly praising his counterpart—a former KGB foreign intelligence officer and currently suspected U.S. election-meddler—to accept a gift of one Adidas AG soccer ball. Turns out that model of soccer ball has a chip in it. Per a report in Bloomberg, said soccer ball carries markings identifying it as part of a line with a built-in “chip with a tiny antenna,” albeit one ostensibly designed by Adidas, not a basement lab at GRU headquarters. The contained NFC chip is “passive and only sends out information,” according to the Adidas website, and is marketed as allowing fans who bring their mobile devices close to the ball access to premium content like exclusive videos, competitions, and challenges. That would be brash by intelligence standards. As Schober told CNN, any device brought into close proximity to the president would be examined by the Secret Service or counterintelligence officials to see if it emitted “any radio frequency”—and even given Trump’s suspiciously friendly relationship with Putin, it seems like a massive stretch the latter leader would be so brazen as to hand the president a bugged device personally. So cue the cries of “fake news!” and all that. That said, the Cold War is rife with stories of Soviet intelligence ingenuity, including a replica Great Seal of the United States containing a sophisticated, pencil-sized resonating device they gave U.S. Ambassador George Kennan in 1952. Dubbed “The Thing,” its operation—powered by KGB technicians in a nearby building who targeted it with microwaves—was only discovered when a British radio operator heard Kennan’s conversations being broadcast on an open channel. In one sense, that’s ominous, given the president does not know how cybersecurity works and is basically the number one guy who would fall for something “silly.” But in another sense, it’s reassuring, given the near certainty Trump does not know how to install an app on his phone. First lady Melania Trump holding the ball after it was tossed to her by her husband.